There are two large empty squares on the Traveller’s Blanket and I’ve been pondering what do with them. I’ve had a hankering for a while now to use some of those beautiful Painter’s Canvas fabrics and so I had a play around in EQ designing an appliqué block and this is what I’ve come up with. So far I’ve just spray basted them into place and added a pin for extra security. I’ve picked out my threads and I thought I’d share it with you. What you think? Is it too over the top? The colors aren’t as true as I’d like them to be you get the idea. Not over the top at all. I like it, and think it will make a nice addition. Linda beat me to it…my thoughts exactely! I love those colors, btw! Agree with Linda, Kate, and Annette! But, I would not use matchy-matchy thread colors. 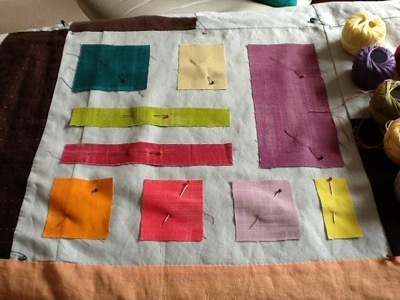 Use the same thread colors, for continuity, but on other patches; ie. 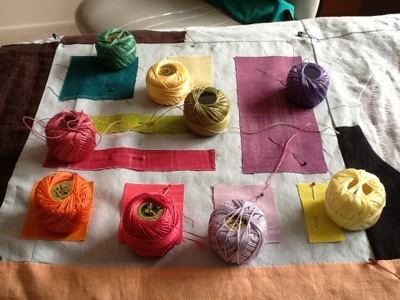 maybe the orange thread on the plumb patch; the yellow thread on the teal patch….) Or, use another thread entirely (black?) on all the patches. Hi Dana. I never thought of that. Unfortunately I had already done it by the time I got your suggestion but thanks anyway. Just keep it in mind for another project. Be sure to post pix of the finished block.